We’re environmentalists, gardeners and ecologists, by nature. But living in a series of cold, drafty houses got us thinking: Others probably were, too. Now we help home and business owners make their buildings a lot more comfortable and much more energy efficient. 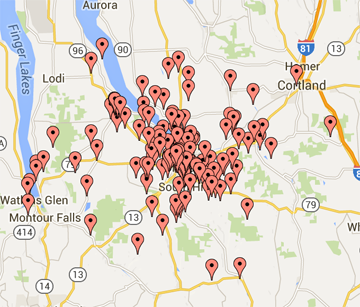 We serve communities in and around Tompkins County, NY including Ithaca, Dryden, Trumansburg, Danby, and Watkins Glen. Dazzle our customers. We seek to delight customers not just with the technical quality of our work but with their entire experience, from initial contact to installation to life in a transformed home. We want every customer to recommend us enthusiastically to their friends and family. Do it right. We seek to meet (and, when we can, to set) the highest standards of workmanship, installing quality materials so that they perform well for decades to come. Take care of the planet. We seek not only to reduce energy use but to specify environmentally benign products, minimize waste, and extend the useful life of buildings. As a Tompkins County certified Rebusiness Partner, we are committed to minimizing business and construction waste. Take care of our people. We seek to develop and retain highly trained and purpose-driven professionals in all positions in our company by providing a safe, fun and rewarding work environment. We are a Living Wage Employer certified by the Tompkins County Workers’ Center, and we provide on-going training, health insurance and retirement benefits to our employees. Never stop learning. We invest in training and research to keep our company at the forefront of the industry. We measure our results and incorporate feedback to continuously improve our operations. We are members of the Ithaca Green Building Alliance, local Chambers of Commerce, and the Sustainable Enterprise and Entrepreneur Network.